Dubai is known for really cheap gold  but you'll have to haggle for it. 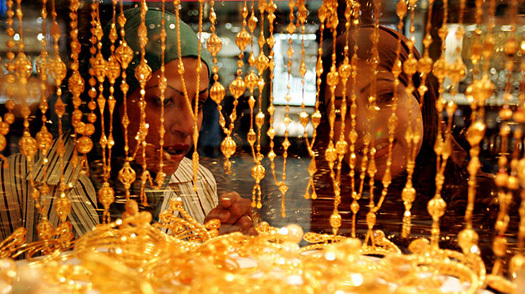 Whether or not you're ready to buy, a stroll through the dazzling Gold Souk is a must. The stores also offer platinum, diamonds and occasionally silver, and the government keeps tight control over the quality of all the merchandise, so rest assured that your purchases will be genuine. (The same cannot be said, however, of the street vendors outside hawking "genuine fake" watches and "Guuci" handbags.) If something in the window catches your fancy, be sure to barter  persistent protest capped with a walkaway will get merchants to drop their asking price by as much as half. Less atmospheric, but even cheaper, is the Gold & Diamond Park, where you can find unique designs or get jewelers to recreate pieces for you at a fraction of the cost of the original.